Happy weekend, friends! Today I leave for Florida, to visit Gramma Lynn. It will be my last visit before the big move, and we have big plans, Gramma and me. Plans which involve crossword puzzles, Mallomars, movie dates and, hopefully, a bit of sun. Gramma Lynn is, very decidedly, the bee’s knees. There’s just no other way to put it. She grows her own tomatoes. She lets me sit at her very well organized vanity and play with her tubes of pink lipstick. She always has a cookie in the cabinet. She drives a convertible, yet has unshakeably flawless hair. She enjoys Steve Carell. You see? Bee’s knees. One day, I’m going to grow my own tomatoes. I don’t think flawless hair is in the cards for me. But tomatoes? Could be. Until then, I’ll make tomato soup from cans (cans? …CANS? Did she say cans?) (Yes, cans. It’s okay, really. It’s winter time, there are no good, fresh tomatoes in sight. Canned whole, peeled tomatoes are cheap, flavorful, and great for soup in a pinch. Try it. Try it so I can close the parenthesis. Okay? Okay). Thank you. 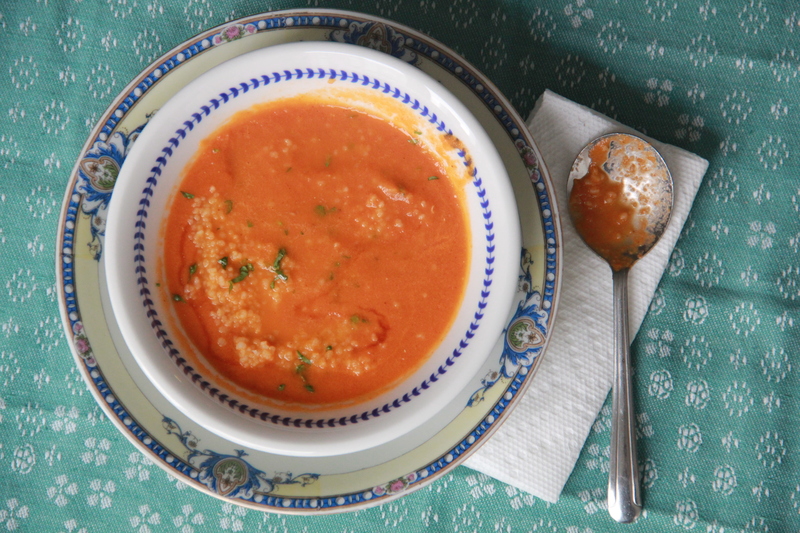 Tomato soup, from canned tomatoes. Or, as Gramma would say, “tuh-may-duhs.” Give it a try. Wear pink lipstick. You might be surprised. I really enjoy this little twist on classic, creamy tomato. This version keeps a bit of creaminess, thanks to a half stick of butter, but the Moroccan spices (paprika, ginger, cumin and cinnamon) add a rich and layered depth of flavor to the soup. 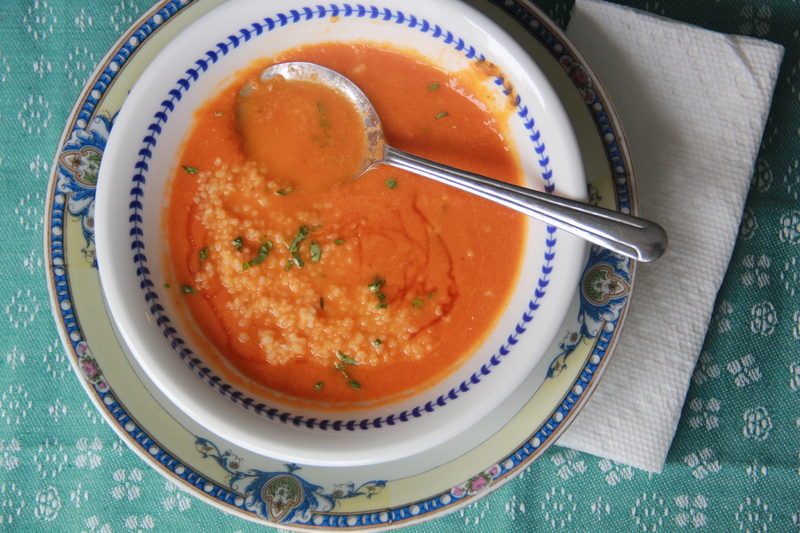 Don’t forget the finishing drizzle of honey – it’s what cuts through the acidic bite of the canned tomatoes. Follow the directions on the box to make the cous cous: bring 1 cup of water to a boil (add a dash of salt and olive oil, if you like), add the cous cous, stir gently. Cover, remove from heat and allow to sit for 5 minutes. Fluff with a fork. For the soup: in a large pot, melt the butter over medium heat. Add the onions, carrots, and celery, and sweat until softened, about 5 minutes. Add the garlic sweat until fragrant. Add the paprika, ginger, cumin and cinnamon, and a big pinch of salt and pepper, and cook 1 minute more. Add the entire can of tomatoes, including the juice, and the chicken broth. Using an immersion blender or counter top blender (if using the counter top version, you might need to work in batches), purée the soup until smooth. Return soup to the pot and heat over medium flame until warmed throughout. Add the lemon juice, honey, and more salt and pepper, to taste. Serve by placing a big spoonful of cous cous into a bowl, ladling hot soup atop, and garnishing with chopped cilantro or parsley, and an extra little drizzle of honey. mmm mmm! this looks so wonderful and comforting! This looks good! Not sure where in Florida you’ll be, but it’s a rainy morning in Tampa. Soup for lunch sounds pretty good. Thanks, Ileana! Was in Sarasota — got some rain, but a bit of sunshine, too! Hope you enjoy the soup. I looove this post! Have a blast with Gramma, have a Mallomar (or a box) for me! Lucky you, having such a cool grandmother….. the bees knees indeed! Will be trying out this recipe soon, as it’s cold and damp here in the pacific northwest…. a perfect addition to my soup agenda. I feel my darling mate is getting a wee bit tired of my latest favorite – butternut/leek soup. Many thanks, and hope your move is as uneventful as SF is exciting. Would it be okay to omit the butter, and use some olive oil instead? And how about quinoa instead of couscous? Are those doable substitutions? absolutely! both good and doable substitutions. let me know how it turns out! Just heard your exciting “move”news from Mom and Dad-we were out with them last night. Congratulations Sweetie!!! All the best to you- enjoy SF, what a great city- and not too shabby! I still think you shoul be a writer- love your blog and especially this tender piece about your sweet Grandma Lynn who I am very fond of too, especially that hair!! This soup looks delicious! I’m in a soup mood lately. I made a Thai Coconut Shrimp Noodle Bowl yesterday, but I think I want to make another soup by the week’s end. This one looks perfect! Thanks, Emilie! This one’s definitely a keeper — so easy and flavorful. Thai Coconut Shrimp sounds amazing, too! Looks so good. Can’t wait to try! Love seeing this winning recipe making a reappearance from the D&C archives! And imagine my delight when I saw a 2012 comment from none other than my Pacific Northwest sister (in-law) Cari who loved it then…and now, I bet. I best get going and try this one along with the beet citrus poppyseed salad from last week. Now, back to your writing, Molly, while we go cook. Archival D&C is good with us for the next few weeks to deadline time.